Jets Pro Bowl safety Jamal Adams took time out from his tour on Radio Row with PepsiCo at Super Bowl LIII to answer a few questions from FanSided. After some rough seasons in the Meadowlands, things are trending in the right direction for the New York Jets. They may very well have found their saviors on both sides of the ball with their past two first-round picks. Second-year safety, Jamal Adams — fresh off collecting co-MVP honors at the Pro Bowl — talked with FanSided about some of his favorite things and what the Rams need to do in order to beat the Patriots in Super Bowl LIII. Paul Centopani: Congrats on winning defensive MVP of the Pro Bowl. The Jets are starting to sow the seeds of success, which includes yourself. What do you guys need to do in the off-season to make the playoffs next year? Jamal Adams: I appreciate that, man. We really just need to get on the same page as an organization. Everybody has the pull on the rope in one way. As long as we do that we’ll be fine. We gotta add certain pieces, little pieces to the team and just complete the puzzle. PC: What’s your offseason workout regimen? JA: I try to stay as active as possible. I took some time off in my first offseason, because I needed it, but going into my second offseason I’m always sweating. Now that the Pro Bowl is over, I’m in Atlanta for the Super Bowl, but I’ll be back on the grind come Tuesday. PC: What’s your favorite thing to do when you’re not training? JA: Family time. Just sitting back and enjoying some family, my nieces and nephews. Just relaxing and soaking up the offseason. PC: Right on. Family’s important. What’s your favorite part about being in New York? JA: Honestly, I would say the fashion. I’m into fashion. You have a lot of things you can choose as far as getting your wardrobe right. I’m always excited about that. I love dressing up, I love feeling good about myself. I think that would be the most important for me. PC: Oh yeah, I’ve seen some of your Instagram pics, you’re looking dapper. PC: What’s the significance of your handle, @presidentmal? JA: So the science behind @presidentmal…Obviously, people call me “Mal” as a short nickname for Jamal. And president, guys just kept calling me that in college and coaches called me that. One day, one of my coaches said, “Whatup, Pres.” I kinda ran with it. I just feel like I’m the boss and I move like the president and I’m always out there to be the best. PC: What excites you most about the Greg Williams hire as your defensive coordinator? JA: I’ve heard so many great things about him, how aggressive he as a coach. He’s definitely gonna use me all over the field. So I’m just excited to get started with him and to have him be a part of the organization, I can tell you everybody’s excited. PC: Have you met coach Gase yet? PC: Okay. I was gonna ask if he explained what happened during his press conference when he got all buggy-eyed and kept looking around. JA: Yeah, I gotta ask him about that when I meet him. That’ll be the first thing I ask. PC: Alright good, please do, report back. 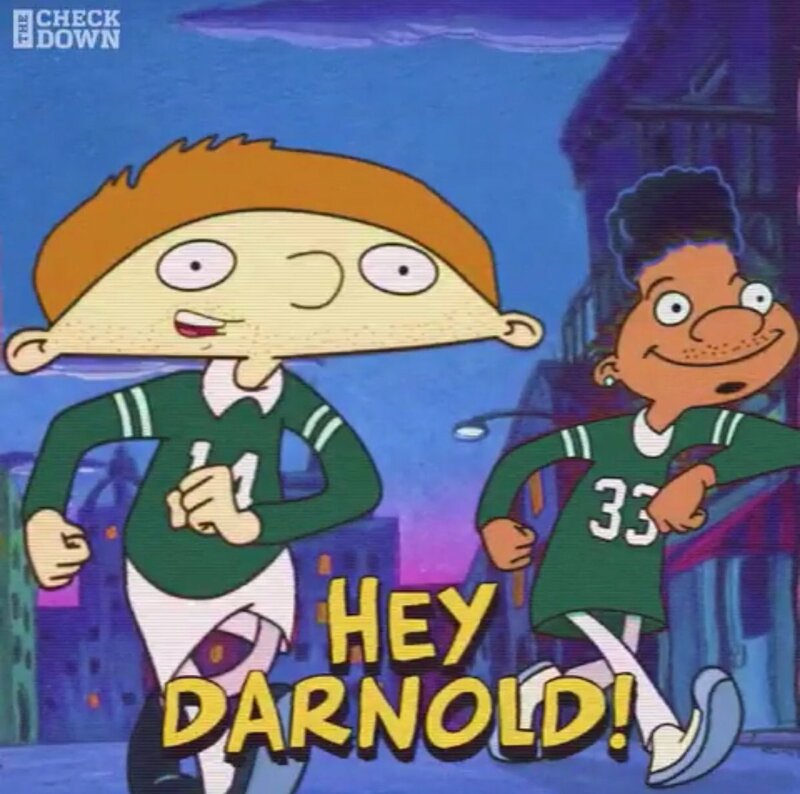 Have you seen the Hey Arnold mashup with you and Sam [Darnold] as Arnold and Gerald? JA: Yeah man, I thought that was pretty cool. PC: Yeah, I think that could be your next Halloween costume for you two. JA: That’d be dope, I’ll definitely look into it. PC: What’s your favorite food? JA: It would have to be seafood, so I would have to go with…a Cajun pasta. PC: A Louisiana boy, there you go. Who’s your pick for the Super Bowl? JA: I don’t know yet, I haven’t decided. But I’m gonna put it like this: if they can slow down Gronk and get pressure on Brady, L.A. wins. If they don’t, L.A. loses. PC: I think that’s very fair. Alright, I’ll put you on the spot with my last question: what’s the Jets record next year? JA: I can’t predict it, man, I cannot predict it. Hopefully, it’s a winning record. That’s the plan. PC: I think you’re definitely moving in the right direction. Jamal, have fun at the Super Bowl enjoy the offseason, I really appreciate your time. JA: Thank you, man. Appreciate you.